The Fenner Valley Water Authority (FVWA) has released a new analysis by water chemistry expert Dr. David K. Kreamer, a professor of Hydrology & Geosciences at the University of Nevada, Las Vegas critiquing two opposition-funded papers to the Cadiz Valley Water Conservation, Recovery and Storage Project. FVWA is the public agency charged with operating and pre-project monitoring of the Cadiz Water Project in coordination with San Bernardino County. 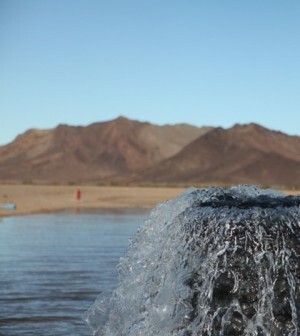 Dr. Kreamer’s analysis reviews two studies funded by Mojave Desert Land Trust, an organization opposed to the Project — “Understanding the source of water for selected springs within the Mojave Trails National Monument, California” by Andy Zdon, M. Lee Davisson and Adam H. Love, published in Environmental Forensics and “Use of Radiocarbon Ages to Narrow Groundwater Recharge Estimates in the Southeastern Mojave Desert, USA,” by Zdon and Love, published in Hydrology. Extensive studies were undertaken during preparation of the Cadiz Water Project Environmental Impact Report (EIR). They concluded that the Project’s operations in the Fenner Valley aquifer system would have no significant adverse impact on desert springs. The Project’s Groundwater Monitoring, Management and Mitigation Plan — which will be enforced by San Bernardino County – and the EIR require quarterly monitoring of Bonanza Spring and two additional springs, as well as other monitoring and mitigation features for the entire watershed system. Bonanza Spring is in the Clipper Mountains at an elevation of 2,100 feet. It is the nearest spring to Project operations, approximately 11 miles away from and 1,100 feet above the Cadiz Water Project’s future wellfield. Geologic study and field work produced last year, and reviewed by a multi-member panel, identified faults separating the groundwater aquifer at the Cadiz wellfield from the Bonanza Spring. Additionally, the enforcement by San Bernardino County has been designed to protect the local environment through extensive monitoring and operating criteria – including a hard “floor” to operations. Enforcement will include immediate corrective measures to ensure the aquifer is managed sustainably before, during and after the life of the project, if necessary. The Cadiz Water Project has received numerous validations of its plans, including its approval under the California Environmental Quality Act, its permitting by San Bernardino County and its affirmation by California’s Courts. In addition to Dr. Kreamer’s analysis, the FVWA Board also heard a report from Lee Odell, P.E., of Jacobs Engineering, who presented the successful results of three phases of pilot testing of water quality treatment technology at existing Cadiz wells conducted from 2015-2018. Project water is slated to be conveyed through the Colorado River Aqueduct (CRA) which is owned by Metropolitan Water District of Southern California. Although water at Cadiz meets all state and federal drinking water standards without treatment, certain naturally occurring constituents such as chromium 6, arsenic, and nitrates, appear at levels higher than those presently in the CRA. Metropolitan had indicated last year it might require Cadiz to meet levels in the CRA, not only state and federal drinking water standards, before entering its facilities. Odell’s report stated that testing was conducted to determine the feasibility of removing naturally occurring constituents prior to any Project water entering the aqueduct; testing successfully removed nearly 100 percent of chromium-6 present, bringing it to below 1 part per billion (ppb). The state standard for total chromium is 50 ppb while the federal standard is 100 ppb. Testing also showed that byproducts of treatment meet the regulatory standards for disposal at conventional landfill.